iTunes users who use Google Chrome web browser faces an unique issue, where when user tries to connect to iTunes Store or iTunes App Store by clicking on “View in iTunes” or “Buy this on iTunes” button in iTunes Preview page or visiting a iTunes Store link (e.g. http://phobos.apple.com/WebObjects/…. ), Google Chrome does not detect, run or open iTunes program to load the iTunes Store item page. 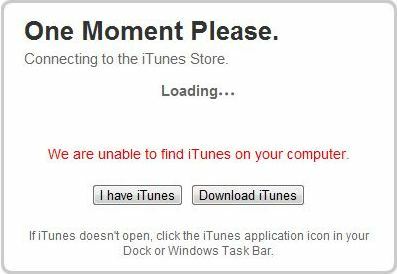 Instead, the web browser is unable to connect to iTunes Store, and the web page will be refreshed and reloaded with error message saying that “we are unable to find iTunes on your computer. To download the app or song, get iTunes now”. Users are then given two options, either to download iTunes, or click on “I have iTunes” button to open the software program now, which of course, still does not open iTunes app on computer. Or user will be redirected to web page to download iTunes free. The error happens even though iTunes is already installed on the computer, and even though user may be using the iTunes at the same time. The error happens on all iTunes links with no exception. In other words, none of the URL or link location that leads iTunes Store will cause iTunes to run and open in Google Chrome web browser. It will simply fail to detect the iTunes that already existed on the system. Google Chrome does not yet handle iTunes links. For users who feel that copying the iTunes Store URL to IE (Internet Explorer) to paste and then click on “View in iTunes” in order to open the item page in iTunes is annoying and troublesome, here’s two workarounds to make Google Chrome able to open iTunes to connect to iTunes Store when clicking View in iTunes button or visit iTunes Store page in Chrome browser. The iTunes cannot be detected issue does not appear on Google Chrome and Safari web browser that running in Mac OS X operating system. 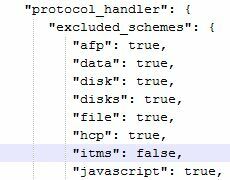 It appears that iTunes Store is checking against user-agent string of web browser in order to return different link protocol. So the hack for Chrome to recognize iTunes external protocol comes in two part. Download and install User-Agent Switcher for Chrome. Right click on the User-Agent Switcher for Chrome icon, and select Options. For “navigator.userAgent”, select Mac Chrome 7 created above in the drop down list, which should automatically fill up the text box for the user agent. Close all Chrome browser’s windows or tabs. Tip: For Chromium, go to %LocalAppData%\Chromium\User Data folder instead. Edit Local State file with any text editor. Search for itms in the file, and delete the complete line. With the trick above, visit any iTunes Store link to let Chrome prompts to launch and open iTunes to handle the link. The trick is not exactly “using” Chrome though. IE Tab is an extension for Chrome that uses Internet Explorer to display web pages in a Chrome tab, allowing web pages to be displayed using IE without leaving Chrome. Download and install IE Tab. Tip: Enter http://itunes.apple.com/* in the Auto URLs in the settings of IE Tab so that every link to iTunes will automaticlaly opened in an IE Tab. For users who encounter error when iTunes built-in browser to indicates that that iTunes cannot be found on the system, go back to Chrome to refresh the IE tab, and then open the item in iTunes Store again.